INDUSTRY NEWS www.officer.com January 2016 Law Enforcement Technology 35 Eye on policing: How body cameras change law enforcement On December 9 the National Law Enforcement Museum presented the 2nd installment of its Conversations on Law Enforcement panel discussion series, sponsored by Target. Held at the U.S. Navy Memorial's Burke Theatre, guests enjoyed a program that detailed various perspectives of the use of this new technology as a tool for law enforcement offcers. National Law Enforcement Offcers Memorial Fund Chairman and CEO Craig W. Floyd kicked off the event by welcoming about 100 guests in attendance. He introduced the panel moderators who detailed their experiences with researching, testing and implementation of body-worn cameras. Panelists also explained how they worked to get communities on board with the idea of body cameras. Another issue that was addressed was public requests for large amounts of video and the diffculties those requests create for police departments—both legally, and in terms of effciency. For more information about the National Law Enforcement Museum, visit www.LawEnforcementMuseum.org. NYPD offcer releases debut novel 'Kingdom of Assassins' with graphic novel adaptation "Kingdom of Assassins" follows NYPD detective Mike Maclaymore as he uncovers a massive terrorist plot—whose mastermind is somehow connected to Mike's days as a Special Forces soldier in Afghanistan. Joining forces with a Saudi princess, Mike races to unravel the plot before America is brought to its knees. Kingdom of Assassins is now available in Kindle, Nook, iBook and paperback formats. Erik Mackenzie is a 12-year NYPD veteran, and author of the short story "Stealing from ISIS." He has also adapted the Kingdom of Assassins novel into a Manga-style graphic novel. For more information on the books and sample chapters visit www.thekingdomofassassins.com. 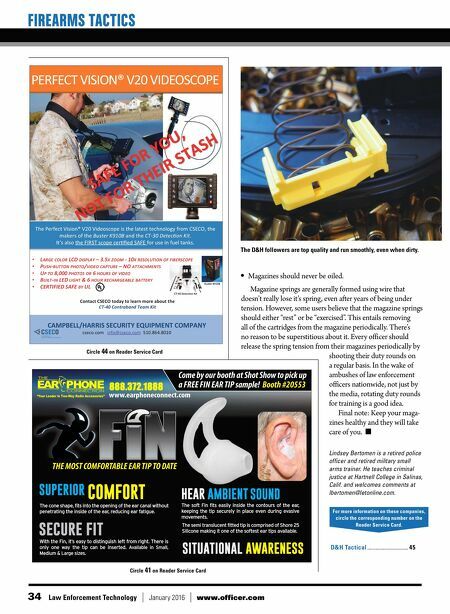 Industry News Company Name — Industry News Company Description COMPANY SPOTLIGHT TASER International and Microsoft Corp.... announced a partnership that will bring together the global scale, technology breadth, and security commitment of both companies through the combined capabilities of the Microsoft Azure cloud platform and Windows 10 devices with TASER's Axon Platform and Evidence.com solution. As part of their work together, TASER and Microsoft will create an integrated approach to capturing and managing evidence including ingesting, retrieving, sharing, analyzing and archiving video, sensor and other data to support law enforcement and criminal justice offcials. 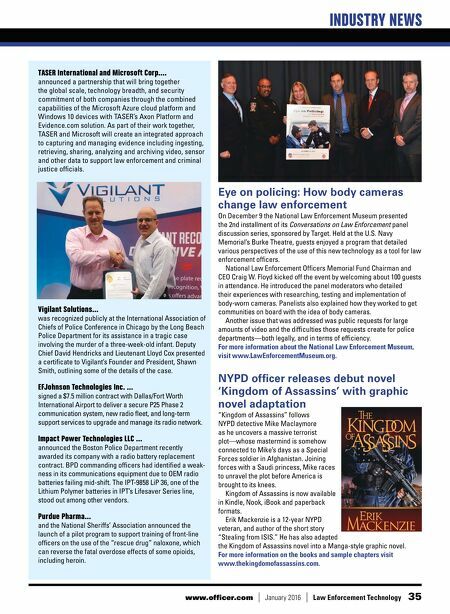 Vigilant Solutions... was recognized publicly at the International Association of Chiefs of Police Conference in Chicago by the Long Beach Police Department for its assistance in a tragic case involving the murder of a three-week-old infant. Deputy Chief David Hendricks and Lieutenant Lloyd Cox presented a certifcate to Vigilant's Founder and President, Shawn Smith, outlining some of the details of the case. EFJohnson Technologies Inc. ... signed a $7.5 million contract with Dallas/Fort Worth International Airport to deliver a secure P25 Phase 2 communication system, new radio feet, and long-term support services to upgrade and manage its radio network. Impact Power Technologies LLC ... announced the Boston Police Department recently awarded its company with a radio battery replacement contract. BPD commanding offcers had identifed a weak- ness in its communications equipment due to OEM radio batteries failing mid-shift. The IPT-9858 LiP 36, one of the Lithium Polymer batteries in IPT's Lifesaver Series line, stood out among other vendors. Purdue Pharma... and the National Sheriffs' Association announced the launch of a pilot program to support training of front-line offcers on the use of the "rescue drug" naloxone, which can reverse the fatal overdose effects of some opioids, including heroin.